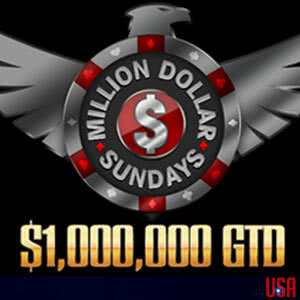 Back-to-Back Million Dollar Sundays in October! How does a $1,000,000 GTD tournament sound? How about three of them? It’s time that you start getting the prize pools you deserve with the three Million Dollar Sunday tournaments coming your way in October! The best part is, one of them is half the normal buy-in! On Oct. 15th and 22nd we’ll host a total of three $1,000,000 GTD tourneys! We’ve held 12 Million Dollar Sundays in our history with the last five exceeding the $1,000,000 guarantee. It’s all part of the $14 Million OSS Cub3d running September 24th-October 22nd! These no-limit Texas hold’em tournaments have 15 minute levels featuring a massive 10,000 chip starting stack to build your fortune! Got a penny? Use the Spin to Get IN tournament ticket slot machine. Instead of entering a qualifier, you can try your luck with our Spin to Get IN feature. A penny could win you a Million Dollar Sunday tournament ticket! As an online poker player, you often don’t get the recognition of your achievements that you deserve. That’s about to change in a big way! If you win the Million Dollar Sundays Event, Black Chip Poker will ship to you a sterling silver bracelet engraved with your achievement!